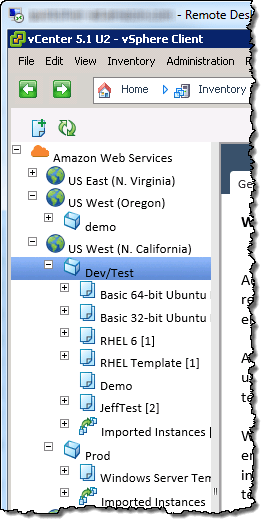 Amazon Web Services releases AWS Management Portal for vCenter. Sign of competition̶ o̶r̶ ̶p̶a̶r̶t̶n̶e̶r̶i̶n̶g̶ ? Chris Wolf, CTO Americas for VMware responded to the release of the Management Portal with a blogpost titled: Don’t Be Fooled By Import Tools Disguised as Hybrid Cloud Management. This provides a clear answer: sign of competition. Amazon Web Services released at May 30 2014 the ‘AWS Management Portal for vCenter‘. This free plug-in for vCenter allows management of virtual machines and virtual networks running on Amazon Web Service from the vSphere Client. AWS Management Portal also allows to import a vSphere virtual machine to AWS. The VMware virtual machine needs to be shutdown to perform a conversion to the Amazon .AMI format as well as the upload to an Amazon datacenter. The management portal also offers self-service access to AWS. A single console now provides management of both VMware on-premises infrastruture as well as public clouds. This is not a comprehensive tool for creating and managing AWS resources. The management portal enables vCenter users to get started quickly with basic tasks, such as creating a VPC and subnet, and launching an EC2 instance. To complete more advanced tasks, users must use the AWS Management Console or AWS CLI. A comprehensive step by step description of the features of AWS Management Portal is published on amazon.com. AWS Management Portal is distributed as a .OVA file which can easily imported into vCenter Server. Download here. Forbes.com reports on the release of the plug-in with a post titled: Amazon Web Services Takes The Battle To VMware . Is this a battle or a sign of collaboration between VMware and Amazon? Both have are marketleaders in their field: VMware vSphere for on-premises datacenters, Amazon for public IaaS cloud. However the hybrid proposition of both is weak. Microsoft has many powerfull cards in their hands. Allmost all organizations worldwide are a customer of Microsoft. Microsoft Azure is developing in a rapid pace and offers many scenarios for enabling hybrid cloud connecting infrastructures and applications. These are general-purpose workloads that are mission-critical, and they may be complex, performance-sensitive or contain highly sensitive data; they are typical of a modest percentage of the workloads found in the internal data centers of most traditional businesses. 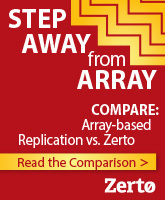 They are usually not designed to scale out, and the workloads may demand large VM sizes. They are architected with the assumption that the underlying infrastructure is reliable and capable of high performance. VMware vSphere is the market leader in hosting enterprise applications located in on-premises datacenters and colocation environments. VMware does not have a large presence in Infrastructure as a Service. Their IaaS offering named vCloud Hybrid Service has been available since end of August 2013. VMware for the first time appeared in the Gartner MQ for IaaS in May 2014. So this release of the AWS Management Portal for vCenter could be the start of something bigger. 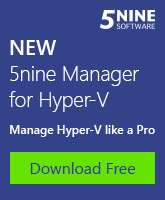 However it is unclear what benefits VMware has. The AWS Management Portal could lure VMware customers to Amazon EC2 instead of the VMware vCHS. Windows Azure Active Directory (WAAD) is a multi-tenant cloud-based identity management service offered by Microsoft. WAAD is used by many services of Microsoft like Office 365, Exchange Online and Windows Azure. WAAD is used for authentication to Office 365, to Microsoft Azure and SaaS applications. 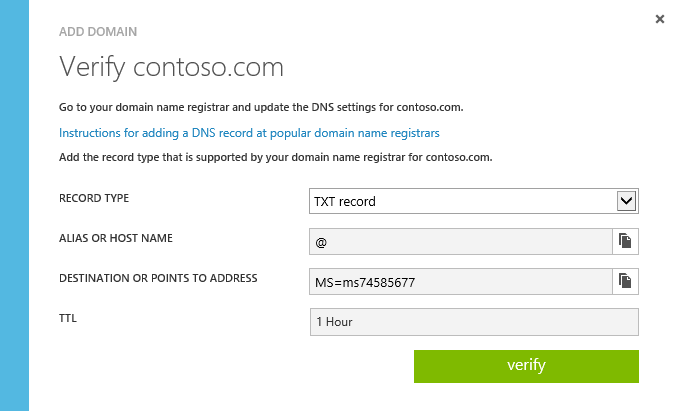 To be able to authenticate using a customer owned domain account like brian@contoso.com , so called custom domains can be added by customers to a Azure AD. Customers adding their domain must prove they own the domain. This is proved by adding a record to the DNS server which is master for their domain. To check the records of your domain services like http://dnsquery.org/ can be used. This made clear the MX and TXT records were not actually added to the DNS server. It was solved in my situation by not typing in the @ sign in the host/name field of the DNS register form of my domain registar. For some reason any record I added which had a @ in the name field was not added. The webinterface however did not shown an error indicating an invalid input. When I used the name of the domain instead of @ , the domain verify was succesfull within minutes. OpenStack gets a lot of attention these days, extra fuelled because of the OpenStack summit which is held in Hong Kong at this moment. Around 3000 people are attending. Hong Kong is not chosen by incident. OpenStack has a remarkable adoption in China. Beijing has worlds highest number of Active Technical Contributors (developers making a contribution to OpenStack). Shanghai is also ranked high. So what is OpenStack? I have asked this myself and thought to write a small blogpost. Certainly not complete, just some observations. OpenStack is not a hypervisor. It is an open technology and open source cloud operating system which enables Infrastructure as a Service in public or private cloud. Some say it is the Linux of the cloud. The software manages compute, networking and storage resources. Those resources can be presented by many solutions. Many commercial and open source solutions are supported. Another definition of OpenStack is a “Cloud Management Platform” (CMP). CMPs are a software layer that sits on top of the software infrastructure and enables a “self-service” model in which application owners can directly request and provision the compute, network, and storage resources needed to deploy their application. Think about the same set of features which are delivered by VMware vCloud Suite. Drivers for organizations to use OpenStack are cost savings, avoiding vendor lock-in and open technology. Its roots are at service provider Rackspace and at NASA who both developed OpenStack. In July 2010 OpenStack was launched. Later it moved to the open source community and is now managed by OpenStack Foundation. The OpenStack Foundation promotes the development, distribution and adoption of the OpenStack cloud operating system. A lot of companies are supporting OpenStack. HP, NetApp, VMware, Intel, AT&T, Red Hat and IBM are just a few names. Red Hat and IBM are 2 of the biggest contributors of OpenStack. Around 5000 developers are working on OpenStack. Each 6 months a major software release is released. OpenSource is as big as development on Linux. At the moment there are less than 200 organizations worldwide using OpenStack in production. However there are quite a few Proof of Concepts running. VMware opened a public beta program of a soon to be released new product named vCenter Log Insight at June 11. The product was originally developed by Pattern Insight which sold their product Log Insight to VMware in August 2012. VMware vCenter Log Insight delivers automated log management through log analytics, aggregation and search, extending VMware’s leadership in analytics to log data. With an integrated cloud operations management approach, it provides the operational intelligence and enterprise-wide visibility needed to proactively enable service levels and operational efficiency in dynamic hybrid cloud environments. The growing popularity of cloud-based computing systems has had a knock-on effect in terms of how much data gets generated in the process. Products like Log Insight help companies monitor that data for problems in their data centers and in cloud environments. Current customers include Intel, Qualcomm, Tellabs and Motorola. vCenter Log Insight is delivered as a virtual appliance .ova file. 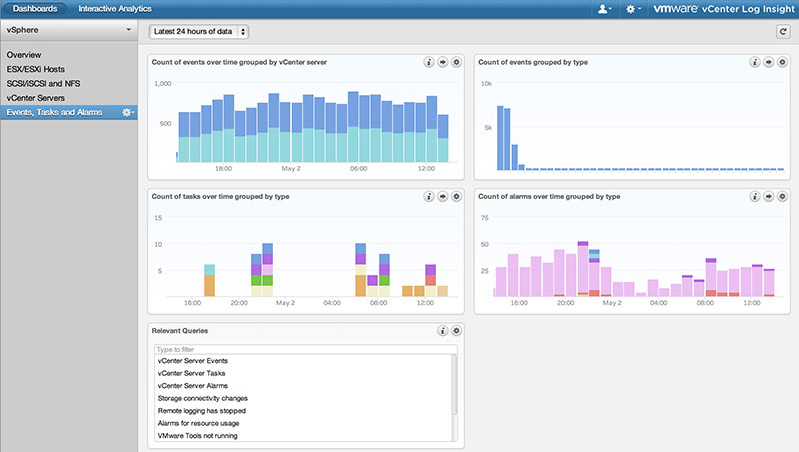 The final release of vCenter Log Insight will be general available in Q3 2013. 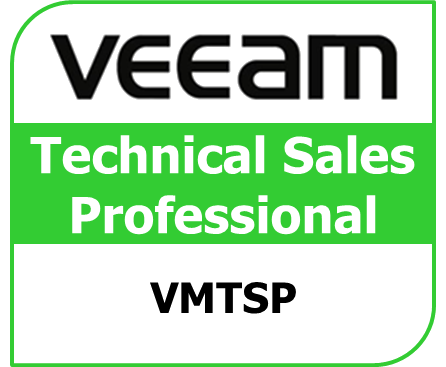 A very comprehensive article on the product can be read at the VMware Office of the CTO blog. Competing solutions are Splunk, Loggly , Papertrail and Sumo Logic. Real-time, actionable operational intelligence and deep visibility across all tiers of your IT infrastructure and applications, without requiring you to know the data beforehand. Intuitive, easy-to-use, graphical interface for simple interactive searches as well as deep analytical queries providing quick insights, enabling fast time to value and improved operational efficiency. Built-in knowledge and native support for VMware vSphere®, making vCenter Log Insight the solution best suited for your VMware environment. VMware vCenter Log Insight is licensed on a per operating system instance (OSI) basis, which is defined as any server, virtual or physical, with an IP address that generates logs, including network devices and storage arrays. With Log Insight, you can analyze an unlimited amount of log data per OSI. The advantage of this is a simple and predictable pricing model that is based on the size of the infrastructure; it does not force you to buy additional licenses to cover the worst-case scenario and pay more for increased log volumes. Given that systems and devices can generate huge amounts of log data during peak times, or while monitoring and troubleshooting for various IT issues, this is an important distinction. Download of the beta and more information at the VMware site. Log Insight Users guide 1.0 can be downloaded here. Gigaom has more news here. VMware vCloud Connector 2.0 has been released at December 20. The software enables management of private and public clouds in one interface. Click here for an overview of features.